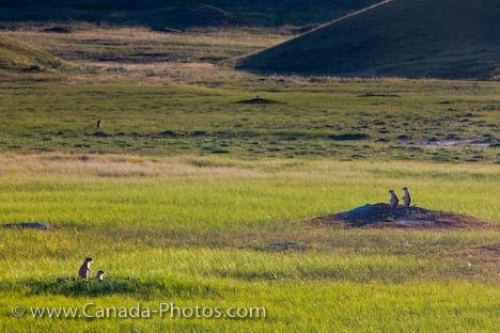 A place known as Dog Town in the West Block of Grasslands National Park in Saskatchewan, Canada is where people can watch generations of Black-tailed Prairie Dog families in the wild. At least 25 or more colonies of Black-tailed Prairie Dogs reside around Grasslands National Park with some ranging in size anywhere from .55 to 172 hectares. A very important animal to the entire ecosystem of the park, these animals love the arid, short grass of the prairie landscape. Here they feed mostly on leaves, stems, grass roots, weeds and forbs along with grasshoppers, cutworms, bugs and beetles. Picture of Black-tailed Prairie Dogs atop their burrows in Grasslands National Park in Saskatchewan, Canada.